I'm an advocate for eating real food. And one of the biggest things my nutritionist taught me was that I should learn how to eat my food and not drink it. But I love to juice. When I first started out on my weight loss journey, I was not big on fruits and vegetables. But fruits and vegetables have essential nutrients that your body cannot create and that you really cannot get in right amount from anything else. So much of my diet is based on fruits and vegetables, while still eating lean meats and as my close friend informs everyone that she meets, "I still eat carbs!" Sometimes, I'm not in the mood to just munch on some broccoli or chow do on an orange. That's why I love my Bella 1000 Watt Juicer! 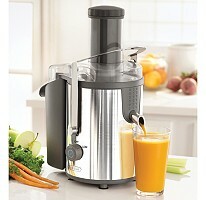 Juicers are like a cars; you pay for good quality. The more expensive the juicer, the more buttons and features it has. But that's not the case with this baby. I bought this at Sam's Club for $49.99. It's not complicated. It doesn't have all the gadgets and crazy buttons. Just turn the knob one way for high powered juicing or the other way for a more slower juicing experience. The ONLY con I have with this is how loud the motor is. Definitely worth every penny of $50.00. can you put ice in it? I just bought this and i cannot take it apart at all! I'm having trouble taking off the steel blade part. Help? ?